The farm environment is visitor- & disabled friendly and easily accessible. Our farm layout ensures shady comfortable conditions for those who prefer it. Tours are comprehensive and are not only interesting but also great fun. It is recommended that groups book in advance. 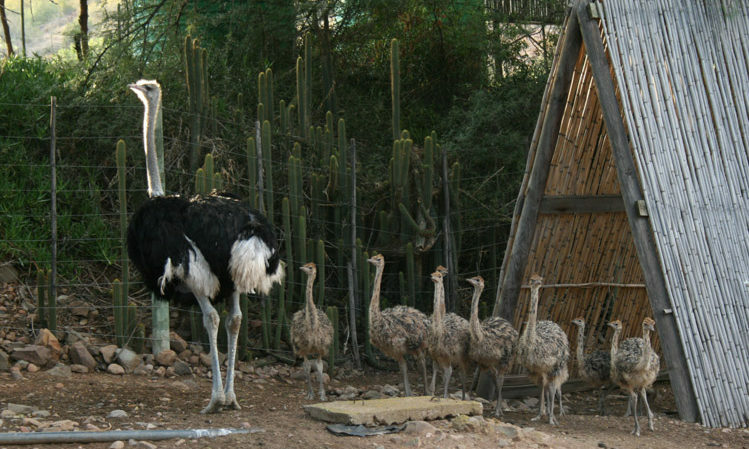 At Cango we believe in a quality ostrich experience. The tour is an easy walk through the farm. Visitors are taken out in small groups by professional guides. We are fond of our animals and ensure that they are always in peak condition. Multilingual guided tours are conducted every 20 minutes and last up to 45 minutes. We offer a la carte in the air-conditioned “Cafe Struisvogel” as well as set menus (to be pre-booked) in our various dining halls, named “Rietkraal”, “Timjan” and “Sam”. Besides delicious meals, these venues offer spectacular views of the lush Schoemanshoek valley. “Cafe Struisvogel” caters for small groups, families and individual travellers. Light meals with mainly ostrich and vegetarian options are catered for. Set menus for groups are available on request. Our spacious curio shop specializes in all kinds of hand crafted Ostrich curio products. We stock a wide range of high quality purses, wallets, handbags, belts, etc. Feather boa’s and dusters are extremely popular and we always have a nice variety of African art and smaller curio’s. Part of our Curio Shop is the Wine House, where we stock local wines from champion cellars in our region. Wine tasting can be arranged for groups of 10 +.